Motorola Mobility has announced three NFC-enabled Razr smart phones exclusively for Verizon – the Droid Razr M, Droid Razr HD and Droid Razr Maxx HD. According to Motorola, all three handsets will run on Verizon’s 4G LTE network and ship with Android and 4.0 Ice Cream Sandwich, which will be upgraded to Android 4.1 Jelly Bean by the end of 2012. Each new Razr also features a 1.5 GHz dual-core processor, 1 GB RAM, 8MP camera and built-in NFC. Droid Razr M: Edge-to-edge 4.3-inch Super AMOLED Advanced display, Chrome for Android mobile browser, extended battery life with new Smartactions feature. Droid Razr HD: 4.7-inch Super AMOLED HD display, 78% more pixels and 40% greater battery capacity than original Droid Razr. 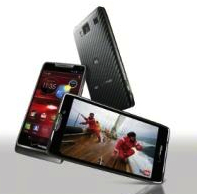 Droid Razr Maxx HD: Same features as Droid Razr HD, but with extended battery life for 32 hours of normal use, 13 hours of straight video playback, 21 hours of talk time, or 8 hours of web browsing. The Razr M is available now for pre-order from Verizon’s website and will be available on September 13th in Verizon stores for $99.99 after a $50 mail-in rebate with a new two-year customer agreement. The Razr HD and Razr Maxx HD will be available before the holidays, according to Motorola.